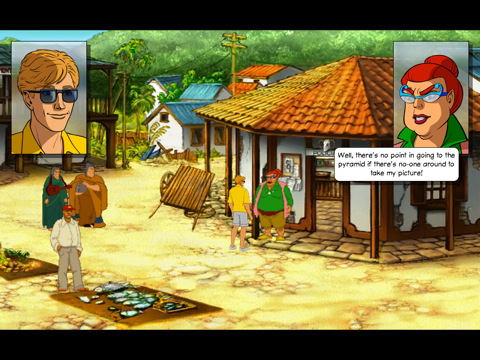 The sequel to the dynamite point-and-click adventure Broken Sword is now available at the App Store. The first installment left it with some very big shoes to fill, and I’m pleased to report that Broken Sword II has successfully risen to the occasion. At $6.99, the Broken Sword games are definitely on the high side for an app, but they’re worth every penny. Production values for the game are sky-high, with gorgeous graphics, challenging, well-designed puzzles, and pitch-perfect voice acting. The sequel also implements the same fantastic touch interface of its predecessor. 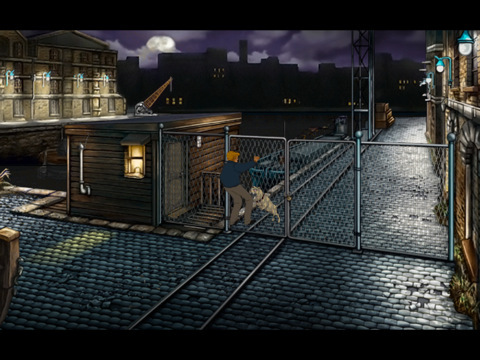 And despite being well over 10 years old, at no point does Broken Sword II ever really feel dated. The continuing adventures of George Stobbart are still as fresh and humorous as they ever were. George and his intrepid journalist girlfriend, Nico Collard, have found themselves in the middle of a new Mayan mystery this time around, and there is plenty of danger and intrigue to go around. All the complexity and style of the first game is continued and preserved in this second installment, and in its updated app format, it’s refreshing to see an old adventure classic improve with a little modern polish. Although the “remastered” claims are perhaps slightly overblown for what is effectively a straight-up port of the original 1997 release, the graphical facelift by Dave Gibbons of Watchmen comic fame, and additional features like Game Center integration and the ability to share save files via Dropbox are very welcome little extras. If you’ve played the game previously, don’t expect to be flooded with new content, but you’ll likely find yourself pleasantly surprised by how smoothly the game has transitioned to the smartphone age. Naturally, I would expect the game to look far better on an iPad, but playing on my little iPhone screen, I was able to navigate with minimal issue. It wasn’t quite perfect, and required a bit of overly fussy tapping in places, but overall, I was pleased. The game handled well, looked great, and I was actually quite struck by the soundtrack and the overall quality of the ambient sounds in the game. The sound guys deserve a big pat on the back for really enhancing the already considerably engaging game environments. Admittedly, my love of point-and-click games is no secret, so it should come as no surprise how enthusiastic I am about the Broken Sword series, but in this case, the acclaim is well-warranted. This really was among the cream of the crop of the Golden Age of adventure games in the 90’s, and it’s aged beautifully. It’s clear there’s a market for point-and-click adventure games on the iPhone, and Broken Sword II is a very fine addition. AppSafari review of Broken Sword – The Smoking Mirror: Remastered was written by Tracy Yonemoto on January 13th, 2011 and categorized under Adventure, App Store, Fun, Games, iPad apps, Puzzler, Universal. Page viewed 4900 times, 2 so far today. Need help on using these apps? Please read the Help Page.